Well, several of my fellow classmates name Delacroix as their favorite painter. And my instructor Roumen back home says that Delacroix is the greatest portrait painter ever. I respect Roumen, so I thought I should pay a visit to the Delacroix Museum. Not to mention, it’s covered on my museum pass. You know how there are some artists that you appreciate intellectually, but they don’t speak to you personally? Well, that’s how I was feeling about Delacroix. There were a ton of his paintings in the Louvre, and I certainly was is awe of the mastery and artistry that went into creating them. But I just couldn’t say they moved me. Again, some of it was subject matter. Epic paintings of events are not for me. So I figured a quick tour of the museum, then over to Dubois art supplies to check it out. The museum was super easy to find. You get off the Metro at St. Germain des Pres, and there is immediately a sign. I’d written down a bunch of directions, but I didn’t need them; there are signs on every corner. Trust me, this isn’t usually the case. Usually you get off the subway, then walk for about three blocks before you can figure out which street you’re actually on. And if there are signs for an attraction, they’re typically sporadic. It is not like following the Yellow Brick Road or breadcrumbs. 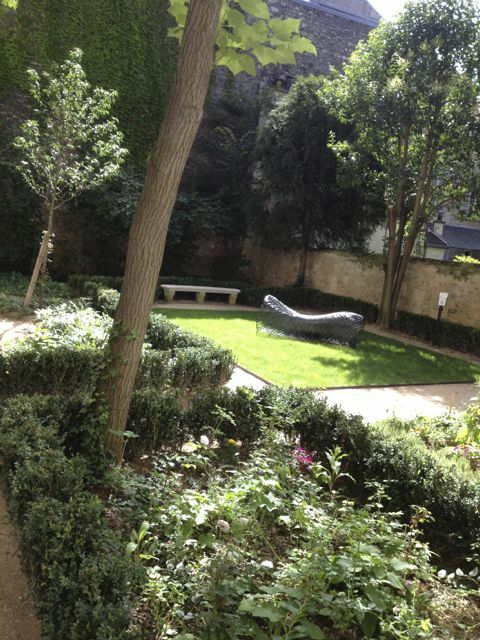 The Delacroix Museum is in a small square surrounded by tony stores. I think the museum might have been a house of his, because there is a studio and a charming little garden outside the studio. I trudged up the tall, skinny steps into the first room, and there they were. The portraits. And they were truly amazing. If you like realistic painting, then this is nirvana. It really doesn’t get any better than this. The detail is amazing, the colors have a lot of snap, the compositions within the frame are great, and in each portrait, he captures something about the person. Delacroix likes dark colors for the most part, which are not my favorite. But he does them so well. And I think these paintings are only about 1,000 times better than the ones in the Louvre. They are so personal and alive. There is one of a young girl that is my favorite. It’s almost humorous with her expression. Lovely. I exit the first room and try to go to the left, but the guides gesture vividly to me, that I must go outside the room into the studio behind it. Evidently they are quite strict about doing things in a certain order. I go through a little pathway to the studio, and there are more great paintings. These are mostly portraits, too, but they look as if perhaps they were not commission work, and that he was trying to do more than capture a likeness. There are also a few experimental paintings that look to be way ahead of their time. I’m a little disappointed at the way they are displayed … lots of glare makes some of them hard to see. The two aides in this room converse the whole time I’m in there. Like the rest of the workers in this museum, they are not very friendly or helpful. It’s also hot in there. No air conditioning for Delacroix lovers. I step outside into Delacroix’s garden. There’s a girl there studying, and a couple that appears to be breaking up. The woman is crying. I’d like to linger for a bit, because it’s quite pretty and there a places to sit. But I feel uncomfortable with the drama unfolding, so I snap a quick photo and leave. I climb back up into the room I was forbidden to go into before. Ah, now it is allowed. I look at some of the amazing drawings Delacroix did. The dude could sure draw horses, which I think are hard. (Mine always wind up looking like dogs.) There are also lots of letters by Delacroix, which I’m sure are fascinating if your French is good. I couldn’t make heads nor tails of them, but I thought it was cool that they had them. These little French museums are very thorough about history and details. If you wanted to spend hours here, you could if you read every letter. A nifty little museum, not crowded at all. Totally worth doing, even if the aides are dour. Still can’t say that Delacroix is my favorite portrait painter, but I now feel like I do respond to some of his work emotionally. I see why Roumen thinks Delacroix is amazing. And I bet the people who commissioned him were thrilled, because I’m guessing the likenesses were spot-on. The eyes are fantastic. And I especially love that one of the little girl, probably because the colors were lighter. Delacroix Museum: Recommended if you like portrait paintings.